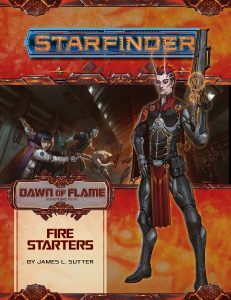 Fire Starters is a sci-fi fantasy campaign module for Starfinder, written by James L. Sutter and published by Paizo. Fire Starters is the first book of the latest Starfinder Adventure Path – Dawn of Flame. Without getting into spoilers too badly, the basics of the adventure path is the group digging into the goings on throughout these well-protected city-globes that rest adjacent to the local star. These aren’t planets orbiting the star; they are in the throes of the star to the point that if they weren’t designed for that purpose, they would have burned up long ago. As is typical of all adventure path entries, you get the adventure and plenty of supporting material. The supporting material includes what is effectively a gazetteer of one location in the greater setting portrayed in the adventure path, a couple of new psychic gear, a look at the local religion, local gear, bestiary (including mechanics to create ifrit player characters), and a starter spaceship. If you don’t like the adventure path, you can easily take all this setting information and create your own adventures within the overarching setting. I personally find the setting to be quite interesting and love how it blends into the sci-fi fantasy theme of Starfinder. If you don’t like spoilers, then don’t read the rest of this review. Fire Starters is broken into three parts creating three distinct milestones within this entry bringing the characters from level 1 to end at level 3. I don’t want to go into too much detail, but each major part is not that dissimilar to the other two. Each one is a location-based encounter that is little more than a sci-fi version of a dungeon crawl, just on a much smaller scale. Each has a well-defined location; each location has well-defined rooms; each room has the possibility to contain an encounter. However, these location clear-outs are a means to obtain the needed milestone that allows the overarching story to continue moving along. The encounters are military-like, but the overarching story is more politically-motivated. Vanilla fantasy players dipping their toes into sci-fi will likely feel a sense of comfort here as the gameplay style is very similar to what they enjoy. Space opera players dipping their toes into a bit more fantasy may get turned off as you spend much of your time moving, shooting, and clearing everything out. If you are going to run the Dawn of Flame adventure path, be very conscious of what type of gameplay your gaming group enjoys and has the best historical experience with. If you don’t want the military-style, use the setting and the overarching backstory of political intrigue to create your own campaign. If you like the military-style, then jump in feet first and enjoy! My humble opinion? The strength of this adventure path lies in the setting and not the encounters. The encounter merely move things along and provide the combat experience. The setting itself is very unique and can lead to some incredibly memorable campaigns without the military-style encounters. But then, adventure path modules always have more value than the adventures themselves.